An appreciation for diversity is the essence of the Women Lawyers’ Association of Greater St. Louis (“WLA”) and has been for forty years. Forty years ago the answer to “Why a women’s bar association?” was simple: women were not represented among the judges in our Missouri courts. That is why in 1976, Anna Forder took on the task of Charter President of a brave group of women who came together with a combined voice to bring attention to this lack of diversity in our judiciary. 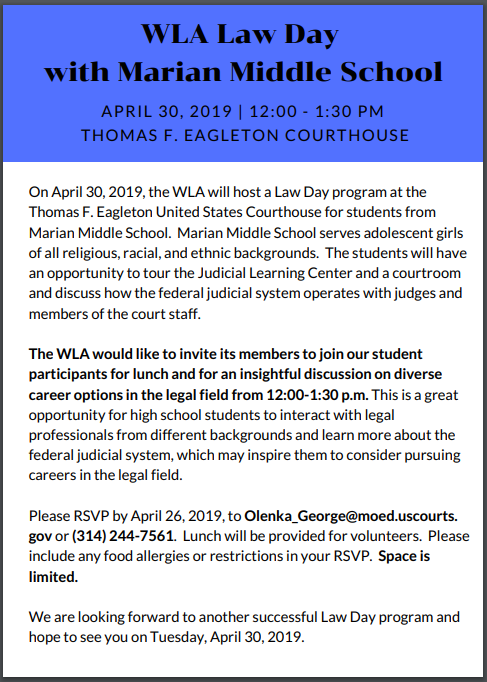 Among others appointed in the interim, only three years after WLA held its first meeting in 1976, Anna Forder herself was appointed to the St. Louis City Circuit Court. Many more stellar female jurists have since been appointed to all levels of the Missouri judiciary, and those appointments were perhaps made possible, at least in part, by the efforts of the WLA to bring attention to the need for diversity on the bench. So, forty years later the question of “Why a women’s bar association” might be asked again. The answer is still simple: diversity in our legal system makes it stronger. Now, the issues might be defined as a lack of gender diversity in our legislature, in the management ranks of our law firms, as lead trial counsel, as general counsel to the corporate world, and as deans of our law schools. The National Association of Women Lawyers has challenged the profession to attain 30% gender diversity in these areas by 2020. See http://www.nawl.org/p/cm/ld/fid=593. And as it has for forty years, WLA today provides a place where women law students and young lawyers can see what a successful woman legislator, partner, in-house attorney, and professor looks like, acts like, and is. That example of success just might inspire young women to be the next legislator, partner, in-house attorney, or professor, at maybe even a higher level and help meet that challenge. WLA’s Board of Directors for its fortieth bar year (2015-2016) exemplified the diversity that underpins its mission, consisting of a plaintiff’s attorney at a mid-size firm, a criminal solo practitioner, an in-house health care attorney, a government attorney, and civil defense partners and associates at both big and small firms. These women spanned the generations represented multiple ethnicities and backgrounds. Going into the next decade, WLA carries a heavy plate of goals to increase its influence in the community by further supporting women in their legal aspirations and providing a safe and encouraging network in which women can find their confidence to succeed. Those goals will be carried out in the 2016-2017 bar year by the most diverse board yet!